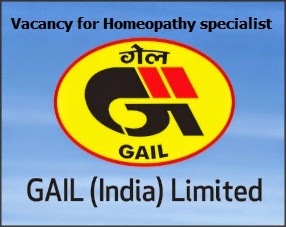 Part - Time Homeopathy Specialist BHMS. Preference will be given to incumbents possessing MD (Homeo) qualification . Two years of post - qualification experience , preferably in a PSU . Rs.1,000/ - (for BHMS)/Rs.1,300/ - (for MD). Check the notification and application below. The part - time doctors will be required to visit the above locations on specified days every week. The duration of each visit will be two hours. Preference will be given to female candidate for GAIL Vihar township. In addition to consolidated hourly fee, local conveyance charges @ Rs. 7.40 per km shall be paid for to & fro journey undertaken during each visit. Eligible and interested incumbents , fulfilling the above Job Specifications may send the duly - filled in prescribed application form ( attached herewith ) along with their Resume , 02 colour Passport Size Photograph s (01affixed on the application form) and attested true copies of the testimonials/documents towards their qualification and experience by Registered Post/Speed Post in a sealed envelope super scribed “ APPLICATION FOR THE POST OF PART - TIME MEDICAL PROFESSIONAL ” to Deputy General Manager (HR D ), GAIL (India) Limited, 16, Bhikaiji Cama Place, R. K. Puram, New Delhi – 110 066 . The application/ Resume and other details as mentioned above must reach the above address by 26 .02 .2015 . Shortlisted candidates shall be called for Interview on a convenient date.